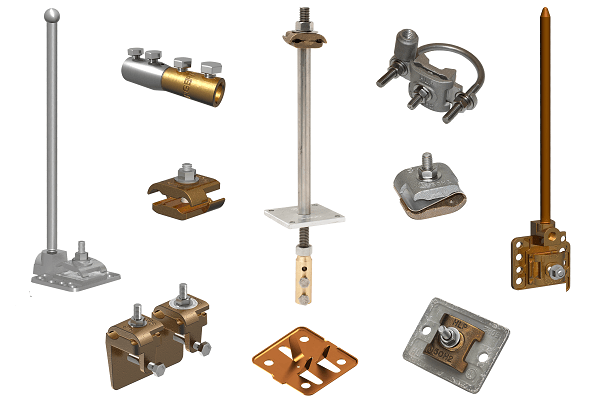 Since 1960, Harger has been providing solutions to the lightning protection and grounding industries. We have experience in all facets of these markets including engineering, systems design, product manufacturing and installation. Our engineering department provides design services for engineers and contractors domestically, as well as internationally. We strive to stay on the cutting edge of technology, offering designs in the latest AutoCAD format. We use only the finest materials in the manufacture of our equipment. Whether the parts are cast, formed or stamped, you can be assured if it's made by Harger, it's quality. We truly believe the customer is the company. We constantly monitor customer service, especially our response time. It is Harger's ultimate goal to ensure that our customers receive the highest quality products in a time frame that fits their requirements. Manufacturing to meet your needs . . .
Our manufacturing engineers stand ready to meet any specialized custom manufacturing situation. Although Harger offers hundreds of different types of products, we realize that some applications require special needs. We have a long history of serving those needs, in a timely fashion. We are well versed in many markets including the Wireless Communications market. When it comes to meeting the lightning protection/grounding needs of the telecommunications provider, Harger leads the way. Harger continues to invest heavily into the latest manufacturing equipment. CNC operated saws, lathes, presses and machining centers enable us to manufacture products with some of the most exact specifications in the industry. Harger's dedication to the improvement of manufacturing processes will help keep us on the leading edge of technology. Many of Harger's innovative products have been developed in house. We regard our people as our greatest asset. Harger is the leading manufacturer of high quality custom ground bars in the country. Harger has long been one of the leading providers of structural lightning protection for commercial buildings. In fact, some of the world's tallest structures such as the Willis (Sears) Tower, 875 N. Michigan Ave. (John Hancock) and the Aon Center (Amoco Oil) in Chicago are protected with Harger systems. Extensive Inventory . . . In order to meet the rigorous demands of the electrical construction, telecommunications and industrial markets, Harger maintains an extensive inventory to ensure prompt deliveries to our customers, domestically and worldwide. We have computerized shipping services set up with UPS, FedEx and several common carriers. Located near Chicago, Illinois, Harger is centrally located to serve the needs of customers from coast to coast. Harger's sales staff, customer service personnel, manufacturing and engineering departments stand ready to assist you with all your lightning protection and grounding requirements. Located approximately 35 miles from Chicago in Grayslake, Illinois is our corporate office and 50,000 square foot manufacturing facility. Centrally located on the eastern seaboard in Fairmont, NC is another 75,000 square foot manufacturing plant. Our mission is to provide the best grounding and lightning protection equipment in the world. We will accomplish this by providing the most accurate engineering designs available and supplying the highest quality materials. We will strive to offer the ultimate in customer service, making every customer our first priority. We will continue to grow our company in a controlled, responsible and profitable manner. We will create a stable work environment for our team members that fosters creativity, rewards innovation and self-motivation, and promotes a high feeling of self-worth. Our patented (UltraShot®) technology utilizes a copper container which becomes part of the connection. 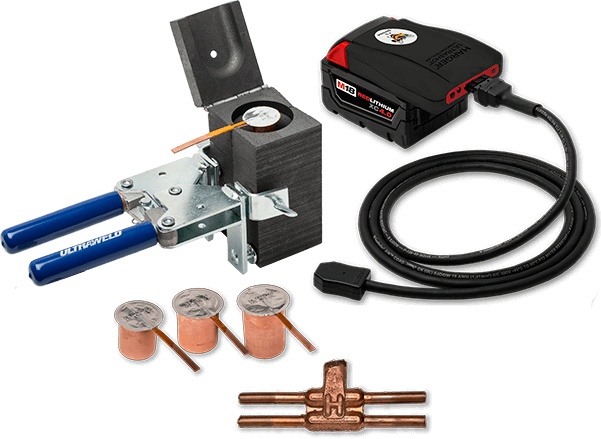 The electronic ignition system fires instantly and uses an 18 volt Milwaukee® lithium ion battery. Approximately 1,100 - 1,500 connections can be made before the battery needs a recharge. The 6’ ignition cord allows the user to maintain a safe distance from the connection. Molds used in the UltraShot process have been proven to last several times longer than ones being used in the conventional process. Today’s sensitive electronic environments require specialized bonding and grounding techniques. 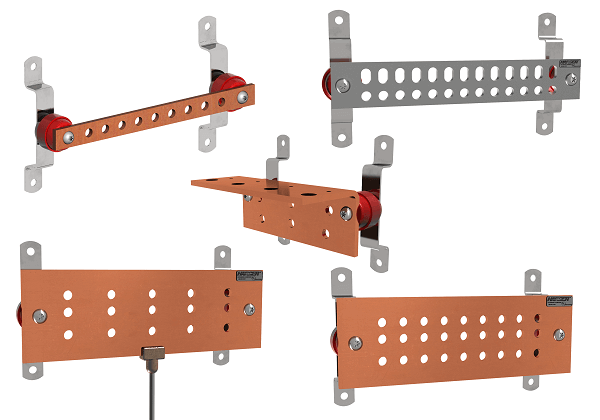 Understanding high frequency, equipotential ground planes and signal reference subsystems are imperative when protecting sophisticated electronic systems; grounding busbars play an important role. Using custom high speed drawing, plating and cabling equipment, conductors are manufactured at the Harger facility in North Carolina. 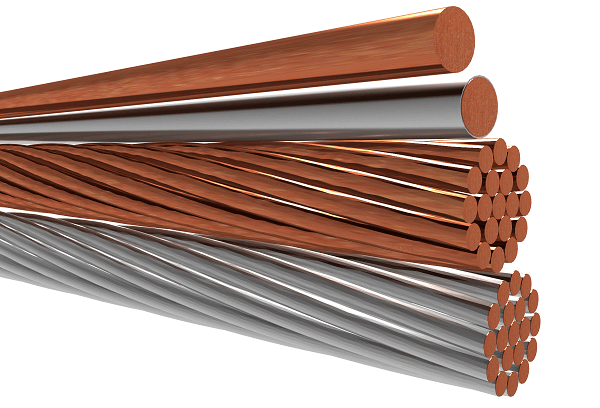 A wide variety of lightning conductors and bare or tinned copper grounding conductors sized #10 through 250 MCM are produced daily. Originally designed as a monthly lightning protection installation training course, Harger University has been expanded to include our entire catalog of training options. Presently we offer Lightning Protection Installation Training, General Bonding & Grounding, Exothermic Certification, and Wireless / Telecommunications Grounding. Our mission is to provide the best grounding and lighting protection equipment in the world. We will accomplish this by providing the most accurate engineering designs available and supplying the highest quality materials.